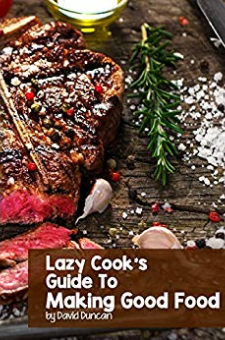 Lazy Cook’s Guide To Making Good Food This Guide Will Help You:• Make delicious food with minimum ingredients that’s easy and convenient • Learn how to cook the perfect steak and roast chicken without relying on recipes • Learn the art of making delicious ice cream that rivals those of premium ice cream. Here are some of the recipes that you’ll find in this book:Crazy Good Baked AsparagusGranitaUltimate Rib Eye SteakGrilled Sirloin SteakBaked CauliflowerButtered CauliflowerButtered AsparagusReal Vanilla Ice CreamKale ChipsBasic Cheese Omelet Baked Snap PeasStir-fried SquashBasil Tomato and Ricotta SaladEasy PicklesEasy Garlic Bread Tartar SauceStir-fried Red CabbageBacon-wrapped AsparagusBrussel Sprouts with PancettaButtered CarrotsBaked Chili PotatoStir-fried Button MushroomsBasic Fruit SaladA Personal Note From the AuthorYou do not need a complicated list of ingredients to make good food. I created this book with this idea in mind. You’ll learn how to make delicious food that you can cook everyday and tweak according to your tastes. You’ll find versatile recipes that you can easily master. And when you’re done reading, you’ll realize that all it takes is a few tools and a little know-how to make delicious food with minimal ingredients.